Editor's Note: Since the publication of this story, the age and military service record of Luther Younger have been called into question. Younger had claimed he was 99 years old and served in the Marines during the Korean War. CBS News has been unable to confirm his age, and has put in a request with the National Archives to confirm his military service record. A reporter for the Rochester Democrat and Chronicle, citing a spokesperson for the Marine Corps, reported that there was no record of Luther Younger serving in Korea. References to Luther Younger's age and military record have been removed from this story. A man from Rochester, New York, may restore your faith that true, lasting love does exist. His name is Luther Younger, and he is deeply devoted to his wife, Waverlee, whom he calls the sweetest cup of tea he ever had. 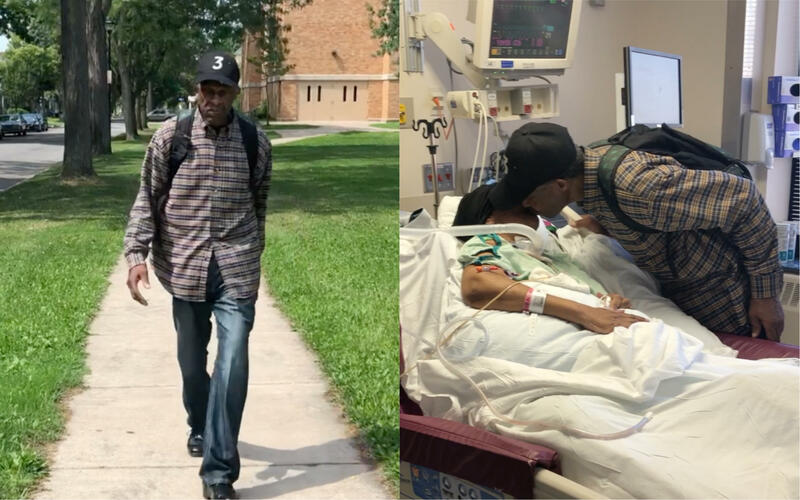 Luther walks six miles round-trip every day — in the heat, rain and snow — to visit Waverlee in the hospital. He has become a local celebrity in Rochester and many people recognize him from his daily pilgrimage. Spectrum News Rochester first reported the loyal husband's story earlier this month and it gained widespread media attention. After hearing about Luther, I decided to go up to Rochester so I could take the three-mile walk with him to Strong Memorial Hospital. It was a hot August day — over 90 degrees — but that didn't faze him. When I arrived at his home on Tuesday, he proved he was in tip-top shape and ready for the trek. He dropped to the floor and started doing perfect pushups. Then he popped up, slung a backpack over his shoulder and said, "Let's go." He told me his daughter thinks he's too hyper, and acknowledged that he probably is. He warned me I would have to keep up with him. I wasn't prepared for him to start running, but he did — several times. I started running behind him, trying to keep up as he led the way through the suburban streets. He prefaced our walk with one thing: "I don't want to talk about nothing except my wife." Waverlee Younger was diagnosed with a brain tumor nearly nine years ago and doctors thought she'd have just five years to live, the couple's daughter, Lutheta, told me. Lutheta says both of her parents have remained extremely strong. Over the past nine years, Waverlee has been in and out of the hospital, sometimes for months at a time. Luther stayed by her side, walking to the hospital to visit every day and often sleeping there, sometimes on the floor. With Waverlee in the hospital with pneumonia for the past three weeks, Luther has again made it a part of his daily routine to walk to her. He told me he could wait for Lutheta to give him a ride, or take the bus, but he doesn't want to. "I got a wife. I don't want to wait on the bus. I want to go up there to see my wife," he said during our walk. Several people recognized Luther during our journey and stopped to chat. He said people often offer him rides, but he declines. During the trek he reiterated his answer to this question several times. He likes to walk because it clears his mind and he says he's always done hard labor for work. He told me he grew up in Fort Worth, Texas, so he's used to the heat. But his daily walk isn't about proving how strong he is. It's about proving his love for Waverlee. "She is a beautiful lady and she treats me as a person is supposed to be ... she made a man out of me," he said. "That's why I love her, because she's tough. She's not weak ... That's the kind of woman I want." On the walk he reminisced about his marriage. He said they met in a laundromat and got married at their home, adding that Waverlee looked beautiful on their wedding day. Lutheta is the couple's only child together, but Luther praised Waverlee for helping raise his kids from a previous relationship. "She wasn't easy. She was the type of person, if you didn't work, you got to go. And I had to work," he told me. "That's why I'm sticking with her, because if it hadn't been for my wife, I wouldn't have made it." We walked through the University of Rochester campus, and Luther started running again when he spotted the hospital building. I told him to be careful, that it was hot out, but he just said, "Come on, we have to get there." He refused water, and it seemed that the only thing on his mind was Waverlee. As he made his way through the hospital hallways, Luther said hello to the staff members as he passed by, but didn't stop walking. When he walked in the door of her hospital room, he said to me, "Watch this ... baby, give me a kiss." He kissed Waverlee, and her eyes fluttered. He is proud his kiss can still make his wife happy after all these years. "That's my cup of tea, and she's sweet too," Luther said, sitting next to Waverlee's bed. "He's always called her that," Lutheta told me. "He's always cared about her the way he does [now]. He loves my mom, He'll do anything for her." Lutheta says she tries to find a ride home for her dad as often as possible, especially when it's hot out. She doesn't like that he walks six miles alone every day, but her dad is adamant and she lets him do it. "My dad says it keeps him alive, it keeps him going," his daughter said. Lutheta also started a GoFundMe campaign for her parents, to help raise money for Waverlee's hospital expenses. At the end of the day, Luther leaves the hospital to let Waverlee rest. He gave me a big hug goodbye and told me I was like a granddaughter to him. We just spent the afternoon together, but in Luther's big heart, that practically made me part of his family. His six-mile round-trip journey would be too much for most people. But when you've walked through life with someone, what's another six miles? Luther is sad to leave his love, but he knows that tomorrow, rain or shine, he will be walking to see his "sweet cup of tea" again.